We believe that startups need corporates and corporates need startups. Startups need corporates as development partners, customers, distribution channels and investors to make better products and grow faster. At the same time, corporates need startups to sell new products to their customer base and survive the global competition. 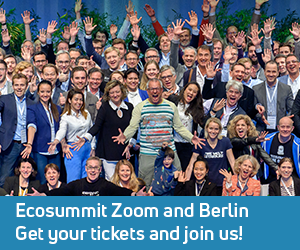 By connecting the companies that should be connected, Ecosummit accelerates startups, investors and corporates with a focus on smart green energy, mobility and cities. Our unique conferences are a physical marketplace enabling personal meetings and long-term relationships in a relaxed and productive atmosphere. Our next Ecosummit takes place on 11 October 2016 at CodeNode in the City of London. The agenda features 37 startup pitches and the conference will be recorded for our YouTube channel Ecosummit TV. Check out our participants, get your tickets and join us. Let’s warm up with a few innovation stories that will be elaborated at ECO16 London.